How committed is the president to kicking big money out of politics? President Obama, who famously used his 2010 State of the Union address to rip activist Supreme Court Justices for removing longstanding barriers to corporate control of the political discourse, did not mention the Court’s wrongheaded Citizens United decision in his 2012 State of the Union address. Not just because the president’s support is needed to expand the campaign to amend the Constitution so that it is clear free speech rights are afforded citizens, not corporations. But because this is a moment when it is essential to explain how Wall Street is using its “money power” to thwart the will of the people when it comes to debt and deficit debates. As the country stumbles toward sequestration, powerful forces are seeking to take advantage of the wrangling. Hoping to capitalize on popular frustration with the fighting in Washington, the failed proponents of a far deeper austerity than sequestration would impose, Alan Simpson and Erskine Bowles, are back with a new plan to hack away at Social Security, Medicare and Medicaid. They are advancing failed ideas, which have already been proven by the bitter experience of European nations to stall growth and increase unemployment. They are advancing failed ideas that have already been rejected by the America people, who voted in the 2012 election against candidates endorsed by Simpson and Bowles and against the most prominent American champion of austerity: House Budget Committee chairman and defeated Republican vice presidential nominee Paul Ryan. Yet they are being heard because of a massive new “Fix the Debt” campaign, which is already spending tens of millions of dollars on advertising and lobbying to repurpose Simpson-Bowles as the only answer to what ails the economy. With financial backing from the nation’s wealthiest CEOs, they are not just advancing an agenda. They are speaking to elected officials as individuals with the power to direct vast resources toward the cause of re-electing or defeating favored contenders. In the Citizens United era, when corporations and CEOs can spend as they please to influence elections, that’s a powerful threat. And Obama should address it. We know the president is aware of the threat. We know that he sympathizes with those who would amend the Constitution to address the money power. Indeed, during the course of the 2012 campaign, Obama indicated that he was supportive of an amendment. After he won that re-election, however, there were fears that Obama and the Democrats had decided that, while they might not always be able to match Republican spending, they could hold their own. The petition attracted more than the 25,000 signatures required to get a White House response. Indeed, it eventually attracted close to 40,000 signatures. 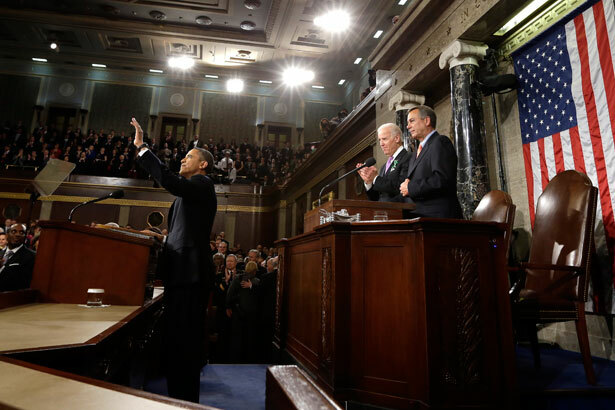 But the State of the Union address came and went without mention of Citizens United or the amendment. In this year’s State of the Union address, [the] President chose to prioritize an economic agenda to create jobs and invest in infrastructure, clean energy, and education. He also called for a National Commission to address the long lines and other chronic problems at the polls every election. But that doesn’t mean fighting the influence of money in politics isn’t important. In fact, President Obama agrees with you. Now, it’s going to take more than a response to this petition or a paragraph in a future State of the Union to get this done. Our founders quite consciously made amending the U.S. Constitution a difficult piece of business. That’s where you come in. If this is a fight that motivates you, you need to work for it. Keep making your voice heard and encourage others to take a stand against limitless corporate spending in our elections. And speak out in favor of changes that will reduce the influence of special interests. There’s a reason that this President has worked to make his administration the most open and accountable in history. He’s trying to lead by example, and change Washington from the ground up. That’s why he banned lobbyists or lobbying organizations from giving gifts to appointees in the executive branch. That’s why he directed agencies to stop appointing lobbyists to federal boards and commissions. That’s why lobbyists aren’t allowed to work in the Administration on matters or agencies they had lobbied in the preceding two years. And that’s why appointees aren’t allowed to lobby the Administration once they leave. It’s why our visitor logs, daily public schedules, staff salaries, and ethics waivers are all posted on the White House website. And it’s why we’ve created a program like We the People—to allow citizens like you to write to us directly and build support to compel our response. If we want to get this done, we all have plenty of work to do in the months and years ahead. So let’s keep at it. That’s not a bad response, except, of course, that it did not come in the State of the Union address. But only in some senses. FDR did encourage activists to press their agendas agressively so that he could better bargain with conservatives in his own party and on the Republican side of the aisle. But he gave those activists more than vague encouragement, especially at points when the battle lines were being drawn on fiscal and economic issues. That was blunt language. Blunt enough to clarify the lines of division on questions of economic democracy, and to rally citizens—and ultimately mass movements—to the cause of economic democracy. Obama would do well to recognize, as Roosevelt did in the 1930s, that the United States is not just wrestling with economic and fiscal issues. This is a time for addressing critical questions of how democracy itself will operate. For so long as the “money power” is able to use its resources to reanimate and reassert failed ideas, the United States will fail to consider a proper range of responses to economic issues. The balance will tip too far toward those who pay for campaigns, and for the lobbyists who seek to undo the results of lost elections. President Obama should, in the style and tradition of FDR, declare that he is against austerity and against the broken politics that keeps buying a place in the debate for “Fix the Debt” fantasies that the American people have repeatedly and soundly rejected. And he can do that by going beyond mere agreement with reformers to a full and muscular embrace of the reform agenda that shifts the defining power in our discourse away from corporations and toward citizens. Watch John Nichols's segment on the "Fix the Debt" campaign.